Yes, I’ve got to Guadec this Friday. After a long trip (fast flight, not so fast train trip), we’ve arrived to the Gnome Village. There you can find lots of Gnomers from nearly any project you’re interested in. Vilanova i la Geltru is a quiet village near Barcelona. Unfortunately the Gnome Village is not near the Guadec rooms, so there’s been lots of problems to move people among the places (dining rooms, centre of the town, bungallows in the village). Also it seems there are few taxis, so if you do something wrong with bus schedules, you’re driving in heavy problems. But it’s Guadec. Lot’s of interesting presentations. Now I’m writing from the Carpa and listening to an interesting speech by John Laerum about how to do a good presentation. I’ve realized I’m not very good at my presentations, but the tips are interesting, and I hope I learn something for my own presentations in the future. Meanwhile I’m going on improving the Gnome Tinderbox 3 deployment at Igalia. Hope it can be complete enough this Thursday, so we can talk about this in the Continuous Integration BOF here in Guadec. Here in Igalia we’re very interested in some aspects of software quality, and in special in continuous integration. We’re very used to have continuous integration services for our projects, as one of the fundamentals to be handle a group of programmers accessing the same repository. Tinderbox2, for Gnome technologies based projects. For example, you can see our Fisterra tinderbox, running compilations every two hours of our middleware. Cruisecontrol, for Java/PHP web based projects. Tinderbox3, the one I’m working on these days. As a result of the petition in Gnome Love list for a tinderbox we started an effort to adapt Tinderbox to Jhbuild, and run modulesets inside. It led to two parallel works, one with Tinderbox2 and one with Tinderbox3. Meanwhile, BxLUG has done some work in the same direction, which you can view in the Gnome JhAutobuild webpage. The Tinderbox2 work was done easily. You can check the current experimental status of the portal in our Tinderbox2 based Gnome Tinderbox. We are integrating unit tests and coverage in it, and we’ve also added RSS feeds for the modules (see here). A wonderful show all builds view, containing the last compilations of all modules in a time line. Rss feeds for every module, and one for all the trees. With them you can subscribe to the last compilation failures. SSL enabled client and server. The comunications in Tinderbox3 are done through HTTP/HTTPS, making easy to do a secure configuration of clients. The compilation clients detect the modules containing a make check rule in Makefile, and runs the tests. As in Tinderbox pure tradition, you can see the modules failing in unit tests stage as orange. I would like to share this effort with community. Related to this, a BOF will be held in GUADEC 2006 next week in Vilanova. There’s more information about the continuous integration BOF in GUADEC webpage. It will be on next Thursday 29 at 12:00. See you there! Yesterday I saw an entry in Juanjo’s blog talking about the book he started to learn programming with. And immediately I decided I had to look for my own start book. It was when I was 7 years old, and my parents gave us an MSX computer (a Toshiba HX-10). 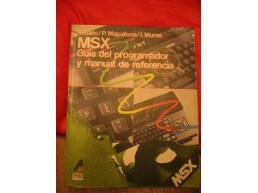 One month later my father decided he wanted to implement software for his business (he’s got a clinic laboratory), and bought a very big book, MSX, Guía del programador y manual de referencia (The Complete MSX Programmers Guide, by T.Sato, P.Mapstone and I.Muriel, 1984). It was the beginning. Since them my life was heavily tied to computer science. I’ve played many games in computers, written a lot of documents, pictures or even music. But the start was a BASIC program. This year I’ve done 20 years programming. Once upon a time, there was gtk-doc. It was weird and strange, and overall, different from other standards like javadoc or doxygen. But we gnomish people, were tied to it, as it was the only one working correctly with GtkObject/GObject. It’s still this way, as I don’t know any good solution with Doxygen or other tool to fill the space of gtk-doc. Why it was weird? For me, the worst point was the need to maintain a set of files called templates. They were docbook templates that covered some documentation that you couldn’t add to your source code. These files were processed by some scripts that didn’t work very well with version control systems. For all of you folks that always complain about how difficult it is to create latex documents with those complex Makefiles compiling figures, linking eps’s, doing bad works to generate pdf or ps automatically, latex-make is here. There are more interesting points. It adds a module to handle .fig files and bibliographies. This week I’ve been hacking a while around Dogtail. It’s a Python library intended for implementation of functional tests of applications providing accessibility support through AT-SPI. It lets you check and manipulate the user interface from Python scripts, and it’s easy to integrate it into test cases. Dogtail uses Python SPI bindings (in project pyspi) to access the accessibility layer. This bindings are a direct wrapper over CSPI. GtkNotebook accessibility implementation has the page tab list role, and the tabs have the page tab role. The notebook exposes the currently selected tab through the Selection interface. It lets you specify a selection of children of an accessible container. Unfortunately neither Python SPI bindings nor Dogtail provide support for this. Then it’s not easy to change the currently active tab of a notebook. I’m not the only one that has detected the problem this way. Peter Johanson has sent two bugs and patches to solve the issue and add tab browsing support in Dogtail (report in Pyspi and report in Dogtail). In parallel I was developing similar patches. As Peter Johansons’ are more complete, I’ve simply added some functionalities this morning to the dogtail patch to provide an easier way to use the selection interface in Dogtail. I’ve uploaded the new patch to the Dogtail bug report. And it raises the desired tab easily. Hope those patches go upstream. I think they're a good solution for the tab browsing issue. Some time ago, in the Guadec-es in Coruña, there was an interesting meeting to talk about interesting enhancement in Gnome desktop. It was mainly centered in i18n issues, but I talked about the way other platforms work in network APIs. Briefly, I missed a way to know about network status and manage connections, as other platforms do (for example, we get this kind of API in Microsoft Windows related SDK with Connection Manager API. The same applies to power management. Bring up the default network connection to the internet if it’s shut down. (Useful for devices like palms or mobile phones or even PC’s with analog modem internet). Maybe with a standard dialog in Gnome. Some knowledge about the network status. Know if the PC or device is plugged, and then decide if our application wants to save power or not. It seems these managers, and their use of DBUS, are the way to go. Good luck! Long time since last time I’ve written here. I’ve been sick some days, trying to work in some stuff. I’ve got my midterm exams in Escuela Oficial de Idiomas (State Language School). I’m doing the 5th degree of English (the last one) here in Vigo. Seems they were good exams. The bad point was the writing exam, which was based on a Lost episode I haven’t seen (7th of the second season). Fortunately it seems it didn’t contain any spoilers. Last weeks I went to two concerts of local groups. The first was in El Ensanche (Vigo), and was performed by Iván Ferreiro, with the collaboration of Xoel. They performed as Rai Doriva e as Ferreiro, playing classic songs as Inbetween days by The Cure, some songs from Andrés Calamaro and so on. Good to see them again. And yesterday I went to a concert of Heissel in Pub Aturuxo (Bueu). Second time I’ve seen them, and again, interesting. This time we talked a bit with some members of the group. They’ve just released their first recording El lugar más feliz(Happiest place). Last week Gnome 2.12 has finally hit completely Debian Sid. Big improvement Rhythmbox to my music player. Libnotify popups, queued-to-play songs UI management and other things. Congratulations to developers! In this week release of Debian Weekly News there’s a request for help from Debian GNOME team. You can see a list of required tasks from Alioth. Maybe an oportunity for you folks, if you want to help in such an important task. Hi guys. Here in Igalia many of us are starting to blog. So welcome to this area!